The Tactical Credit Card by Survival Hax is a thin tool card that slides into any credit card or driver's license slot on a wallet. This little multitool packs a mean punch and can assist in several emergency situations. Not just a survival tool Whether you need to cut a thread off your clothing at the office or you need a toothpick after a meal, this super thin card will keep you prepared. Here is a breakdown of the gadgets. Knife - The knife has a grip that fits between your fingers. The blade is partially serrated and has a fishing line cutter on the tip. The center of the blade has a hex tool which can be used to tighten 3 different bolt sizes. Magnifying Glass - Use it to read a receipt, small print on a pill bottle, or to harness the power of the sun. Great to have if your tinder is damp. Compass - Find your way home. Bottle Opener - This doubles as a hook, bottle opener, and screw tool. You never know when you'll need to tighten one. Toothpick - Dismantle a bomb or get the kale out of your teeth on a first date. Tweezers - With these tweezers you can pull any splinter. Use the magnifying glass if it's small. Fire Starter Flint - We've added a magnesium fire starter because starting a fire with a magnifying glass alone can take a lot of time. Paracord - Mend your clothing or shoe laces on the go with this 550 paracord. Emergency Whistle - Whistle for help or scare a snarling dog away. Blade Sharpener - What good is a knife if you can't keep it razor sharp? Specs and package details: Size: 3.5 x 2.3 x 0.2 inches 1 x Protective Sleeve 1 x Gift Box 1 x Free Paracord 1 x Free Emergency Whistle 1 x Credit Card Tool Our motto at Survival Hax is that it's better to have it and not need it, than it is to need it and not have it. Now go save the day with your new wallet tool. 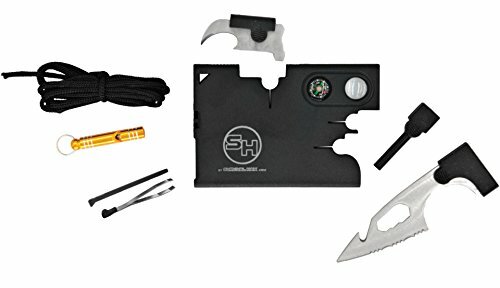 CONCEALED TOOL CARD - 12 survival tools in 1 slim wallet card. FITS IN YOUR WALLET - This handy multitool card will fit into any standard credit card slot. It has the thickness of 4 credit cards. SHARP CARD KNIFE - The knife is a durable partial serrated blade with a fish line cutter tip and hex tool. GREAT GIFT - The perfect survival gift for that special someone who wants to kick down the door and save the day. SATISFACTION GUARANTEE - At Survival Hax we respond to all issues within 6 hours and will work hard to make you happy. If you have any questions about this product by Survival Hax, contact us by completing and submitting the form below. If you are looking for a specif part number, please include it with your message.